Evolution News and Views noticed my previous post, and wrote a little reply. Unfortunately for them they completely missed the point, that Dembski claimed “Darwinists” were making stuff up, when there was good theoretical and (indirect) observational evidence to be confident that planets abounded in the galaxy. The 55 Cnc system (excluding the outermost planet), 55 Cnc e is marked by the red cross near the sun. 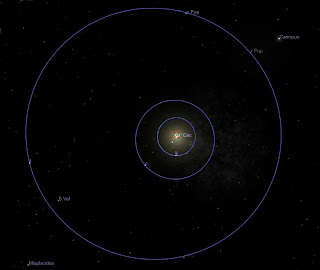 The 55 Cne system has features similar to our solar system. The typical exoplanetary system is very different from our Solar System. Jovian planets are being discovered in very tight or highly eccentric orbits. Jovian planets in our Solar System are characterized by large nearly circular orbits. Our Solar System looks ever more like the exception, and it is exceptional in ways that are life friendly. 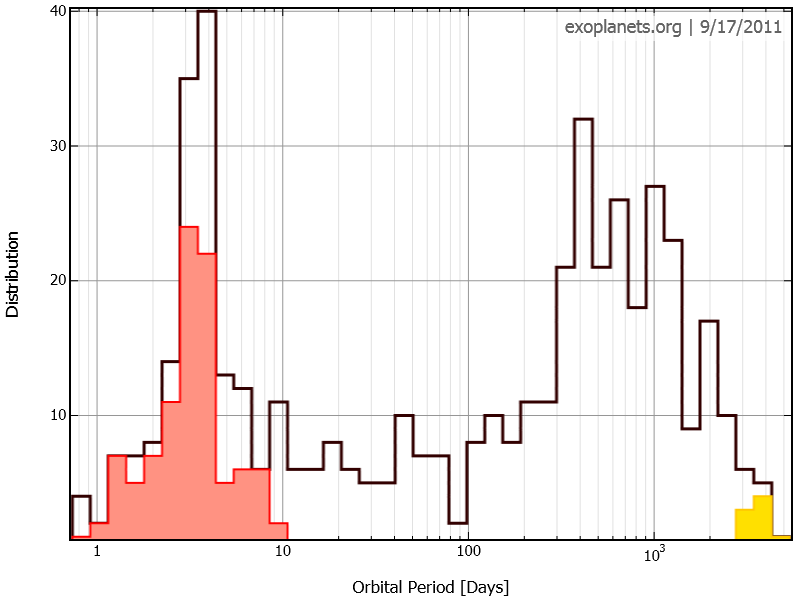 Distribution of orbital periods of the currently discovered exoplanets. 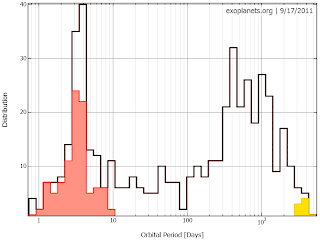 The pink bars are “Super Jupiters” and the yellow bars are Jupiter-like planets in Jupiter period orbits. Well, that’s sort of true, but deeply misleading. When we first started looking Super Jupiters were the norm. To explain why, and why this is no longer true, I’m going to digress for a moment to explain the main methods used to find exoplanets. The first is the radial velocity method. Here the slight wobbles produced in the position of a star by the gravitational tug of an orbiting planet are detected by Doppler shift. In the transit method, the slight dimming in the stars light as the planet passes in front of it. Naturally, the changes are very small, right at the limit of our ability to detect them. This means that bigger planets are easier to find than smaller ones, a big planet tugs more, and can block more light. Planets that are closer to their suns are also easier to find, big close worlds tug more, and can block more light. 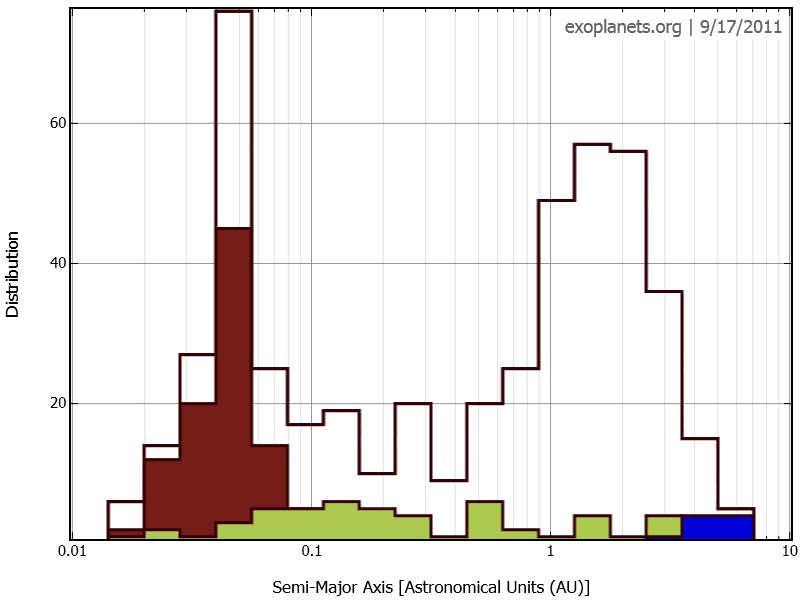 Distribution of exoplanets distance from their suns. Red is “Hot Jupiters”, Green is multiplanet systems and blue is Jovian planets at Jovian orbits. When we first found exoplanets, back in 1995, they were jaw-dropping hot super-Jupiters closer to their suns than Mercury and screaming around their suns in a handful of days! This was a big surprise, no one expected big planets to be that close. There were also lots of weird orbits (although some of these eccentric orbits turn out to be artifacts of the way multiple stars systems orbits sum up). Finding solar systems like ours is rather difficult even given the limitations of the telescopes we are using (which will have great difficulty finding Earth sized worlds in the first place). For example, if you were looking at the Sun for Jupiter, you would have to watch for 12 years to detect it, and you would need to wait 24 years to confirm your detection. So it is no wonder that our explanet detections up until now have been dominated by massive planets orbiting closer to their suns then Mercury is to ours. Now with Kepler, HARPS and MOST we are seeing a wider range of solar systems, although still biased away from Earth-like worlds and solar systems like our own you can see from the diagrams above that Super Jupiters no longer predominate, and we have more normal sized planets in more normal sized orbits predominating. While the typical extasolar system is different from our own, with more Saturn and Neptune sized worlds (quite a few are closer in, but these are orbiting smaller suns, so their relative positions aren’t to far off), the way Dr. Gonzales has written his piece suggests that the typical extrasolar system is hot Jupiters in eccentric orbits. Which they are not. We are still getting weird ones, like the planet where it rains pebbles, but even with the gross under-sampling of Earth-like worlds in the current surveys; of the 677 official and 1270 still to be confirmed planets, 54 are in the habitable zone, and 4 are Earth-like (although they are “super -Earths”). When you use these (grossly underestimated) figures to estimate the number of terrestrial worlds in their stars habitable zone (around stable, long lived stars) you get between 50 million to 50 billion habitable worlds depending on the assumptions you make. 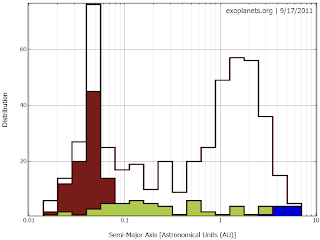 If you take the low end estimate, and factor in habitable exomoons (shades of Avatar), then you get a figure of roughly 100 million habitable environments per galaxy which can now be used to come up with an estimate of habitable worlds in the visible universe. The number works out to 1018, or 10 million trillion. I’ll let that number sink in a bit. Now, Dr.Gonzales has written that there is a lot of work going on understanding habitable zones, which there is, but he implies that it is all shrinking the habitable zones (which it isn’t). As well, some old constraints (like having a large Moon to stabilise a worlds orbit (which turn out to be relatively common) see to be less constraining than we thought, the abstracts on habitability from the extreme solar system conference). Even with very conservative estimates, we still have more than enough worlds in the Habitable zones of stars of our Universe to make Dembski’s original statement false. As well, we have seen how once again the Discovery Institutes members try to distort facts. The DI still fails at exoplanets. The point in question was whether there was any theory of planetary formation at all which gave confidence that there would be large numbers of planets in the galaxy-universe as opposed to the proportion of planets that were habitable. No astronomer or evolutionary biologist ever suggested that all planet bearing stars had a planet in a habitable zone, but as far back as 1978 rough estimates of habitable planets came in at the 10 million mark for our galaxy.